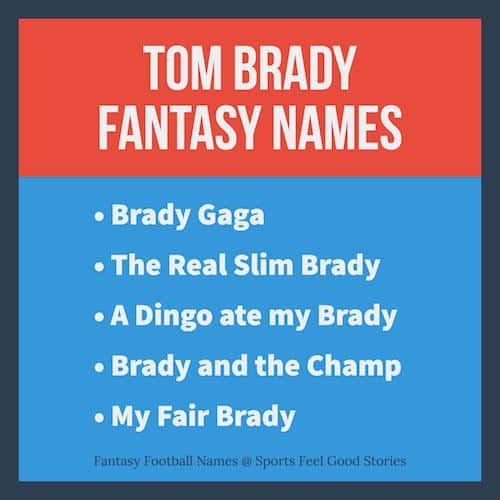 You’re on Tom Brady Fantasy Football Names – page 7 of 30 pages on fantasy football team names and league names. See menu at bottom of page. A NFL quarterback that starts in five Super Bowls is reason enough for reviewing our Tom Brady Fantasy Football Names collection. Many fans, especially up New England way, consider him the GOAT — Greatest of All Time. Take a look at our names below and see if you find something to your liking. Here’s my #, call me Brady. Nobody Puts Brady in the Corner. Check out the New England Patriots Fan Guide. If you’re lucky enough to field a fantasy team with Touchdown Tom as your QB, you’ll want to give heavy consideration to featuring a cool fantasy football team name that features Mr. Brady. A Dingo ate my Brady. Tom Brady wears UGG Boots. Check out: Fantasy Football Sleepers 2019. • In high school, Brady was a left-handed hitting catcher on the baseball team. He was drafted in the 18th round of the MLB Draft by the Montreal Expos. He also played basketball and of course, football, in high school. • Tom Brady’s wife Gisele Bundchen speaks five languages and holds a helicopter license. Check out the official Facebook page of Tom Brady. 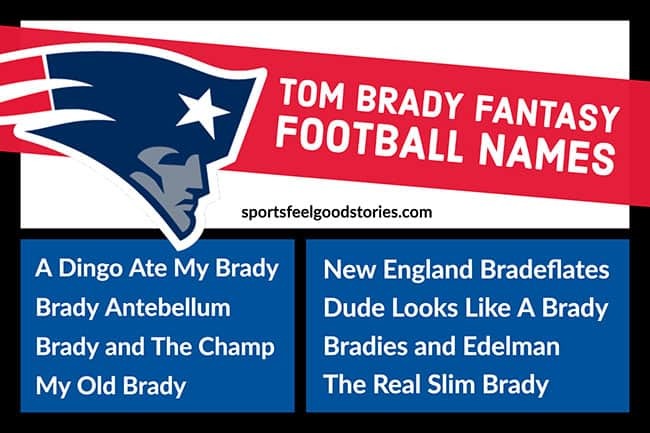 Check out these other New England Patriots Football Team Names. Hit Me Brady One More Time. Luck be a Brady tonight. One hell of a Brady. Brady is said to go to bed at 9 p.m. and rises early without the aid of an alarm clock. He’s also very disciplined about eating. He indicated that he has never eaten a strawberry in his life. He’s married to super model, helicopter pilot Gisele Bundchen. Read up on the University of Michigan Wolverines football program. Check out Julian Edelman fantasy football names by clicking on graphic above. 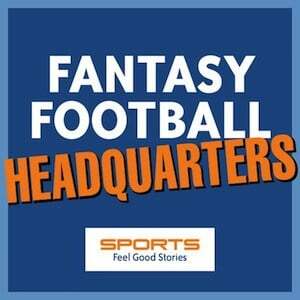 If you have any suggestions for funny Tom Brady fantasy football names, please let us know via the contact us page. Thanks!